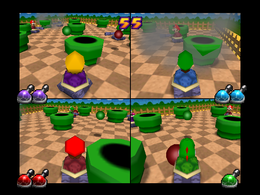 Shell Shocked is a 4-player minigame in Mario Party 2 and reappears in Mario Party: The Top 100, a minigame compilation title. The term "shell shock" is used to describe a disturbance caused by a prolonged exposure to active warfare. The players attempt to knock off the rest of the players by shooting cannonballs with their tanks. Players can also use a lob shot if a player is behind a Warp Pipe. In Mario Party 2, there are three randomly selected levels, which can be chosen by players in Mini-Game Land. The levels vary depending on how many Warp Pipes are going to be put in there as obstacles. Stage 1: One pipe in the center. Stage 2: One pipe in the center of each wall. This is the stage used in The Top 100. Stage 3: One pipe in the center, with 8 pipes surrounding it. In the Mini-Game Coaster, the stage that's used is depended on the skill level that's played; Stage 2 for Normal; Stage 1 for Hard. 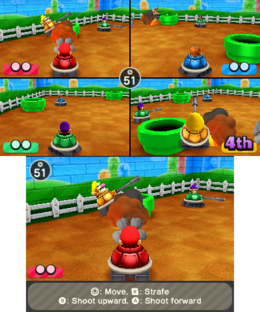 This is also the final minigame, where the human player plays against a team of three Koopa Kids, with Stage 3 being used. In Mario Party 2, if all four players are knocked out of the game or the time limit reaches zero, the minigame will end in a draw. Game Rules – "Captain a Koopa Tank in an all-out duel! If you get hit twice, you're shell-shocked!" World 4-5 – "Pilot your Koopa Tank and take on your rivals! Knock all opponents out to clear the game!" World 9 – "It's a Baby Bowser Tank battle! Defeat all three Baby Bowsers to clear this Mini-Game!" Advice – "Press the Button to fix your aim in one direction and move in another." Description – "Shoot the rival tanks! Get hit twice, and you're out!" On-screen – "Shoot the rival tanks!" This page was last edited on November 30, 2018, at 12:21.